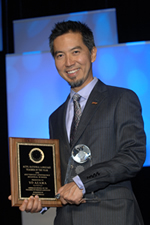 November 18, 2011, Alexandria, VA – Yo Azama, a Japanese teacher at North Salinas High School in Salinas, CA, was named the 2012 National Language Teacher of the Year by the American Council on the Teaching of Foreign Languages (ACTFL) at the organization’s annual convention held in Denver, CO. The Teacher of the Year is chosen from a field of five regional winners from around the United States. Other regional finalists for this year’s national award are Susanne Kanning, German teacher at Inglemoor High School in Kenmore, WA; Sherri Harkins, French teacher at Pittsville Elementary Middle School in Pittsville, MD; Wendy Brownell, Spanish teacher at Camdenton High School in Roach, MO; and Lisa Podbilski, Chinese teacher in Berkeley Preparatory School in Tampa, FL. The 2012 ACTFL National Language Teacher of the Year is a graduate of California State University in Monterey Bay, CA, and holds a single subject credential from that university’s program. He also has a multiple subject teaching credential from the New College of California and a Bachelor of Arts in Music from Showa Academia Musicae in Kanagawa, Japan. From 1996 to 1999, he taught Japanese at Clarendon Elementary School in San Francisco, and from 1999 to 2000, he taught Japanese, English Literature and a cultural exploratory class at Gaviian View Middle School in Salinas. Since 2000, he has taught Japanese at all levels at North Salinas High School. He has published widely in the field of language education and culture. He was named Teacher of the Year by the Southwest Conference on Language Teaching and has received many awards since beginning his teaching career 15 years ago. The National Language Teacher of the Year award, which is sponsored by ACTFL and publisher Holt McDougal, was created to recognize a foreign language teacher who exhibits excellence in language education. The selection process includes the submission of a portfolio and a teaching video. Nominees are first evaluated by their state language organization, after which each state submits its top candidate to one of five regional committees for additional review. Regional winners are evaluated and interviewed by the ACTFL awards committee. As a spokesperson for language education over the coming year, the winner of the 2012 award will deliver presentations at foreign language conferences, meet with policymakers, and appear at events to promote language education through the Discover Languages . . . Discover the World!® public awareness campaign. The 2011 ACTFL Convention and World Languages Expo, held Nov. 18–20 at the Colorado Convention Center, hosts more than 6,500 language teachers and administrators and offers more than 600 program sessions and workshops, as well as more than 225 exhibits. Conference highlights include a keynote address by Dr. Milton Chen, senior fellow and executive director, emeritus at the George Lucas Education Foundation, and special feature sessions highlighting the latest research findings and developments in language education. The American Council on the Teaching of Foreign Languages (ACTFL) is the national association for language education professionals from all levels of instruction and representing all languages. With more than 12,300 active members, ACTFL provides innovative professional development opportunities, acclaimed training and certification programs, and widely cited books, publications, scholarly journals, research studies and language education resources, including Foreign Language Annals and The Language Educator magazine. As part of its mission and vision, the organization provides guidance to the profession and to the general public regarding issues, policies, and best practices related to the teaching and learning of languages and cultures. ACTFL is a leading national voice among language educators and administrators and is guided by a responsibility to set standards and expectations that will result in high quality language programs. For more information, visit the website at www.actfl.org.